Check out my bitchen book display case! Yea.. I made it myself. 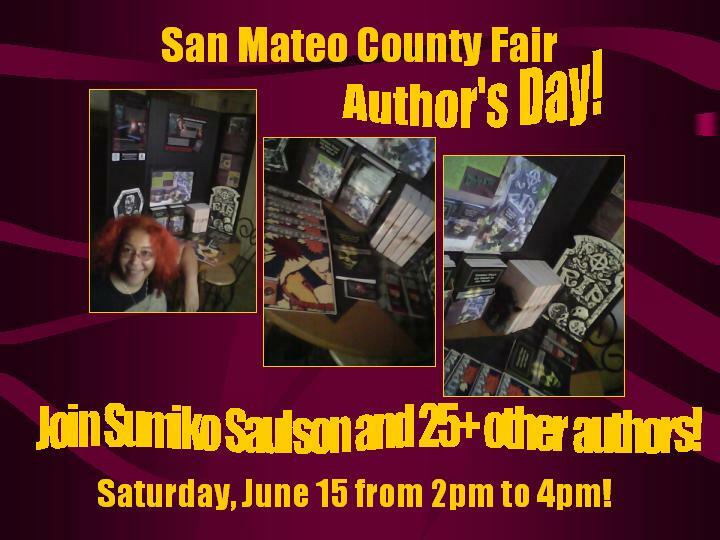 Steampunk author Laurel Anne Hill is one of the 25+ authors who will be at Author’s Day at the San Mateo County Fair from 2pm to 4pm on Saturday. She wrote How Beer Saved the World and the Aurora Award nominated Shanghai Steam. HorrorAddicts.net writer, blogger and horror author Emerian Rich, winner of the 2011 Polidori Award will be there. I will be there with copies of Things That Go Bump In My Head, Solitude, and Warmth – oh! And the new dystopian science fiction comic Agrippa… stop by and pick up a free bookmark! It will be really cool, a lot of fun, and a chance to “read local” and support your local authors and pick up signed copies! If you would be so kind, share and help me get the word out! ~ by Sumiko Saulson on June 14, 2013.